The last full day it rains so hard that the beach road fills with water and we all occupy the house, puttering from room to room, doggedly eating all the snacks so we don’t have to take them back to the real world. By 11 my mother-in-law has made gin and tonics and I’m curled up on the couch with both my daughters, all three of us reading: me Tinker Tailor Soldier Spy; the older her last remaining beach book, E.L. Konigsburg’s short-story collection Altogether, One at a Time; the younger one of her sister’s old Rainbow Magic books, which she can’t quite read but likes to flip through briskly, since that’s what her sister’s done for years. On the wall by the door to the porch is the posterboard we’ve decorated to keep track of our reading counts. My daughter is beating me handily. 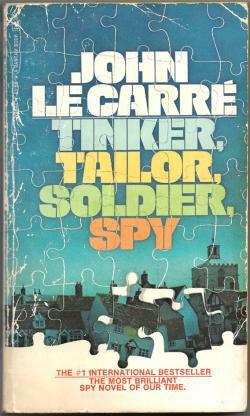 I wrote a while ago in Slate that this old Bantam edition of Tinker, Tailor was my ideal vacation read: a book I’d wanted to read for years, one that I knew would be engrossing and intelligent, one that I felt certain would challenge me a bit but not too much (after all, I’d seen the movie). And this mass-market copy, with its jigsaw motif and faded 1970s colors, elegantly implied to passers-by that, oh yes, this is my third or fourth time through, who could keep track? Of course on this rainy day there are no passers-by but my family, who all know I am full of it. My daughter finishes one of the stories in the Konigsburg collection and asks me to talk with her about it, because it’s left her a bit confused. “Sure,” I say, and bring it to the table with me for lunch. (Finally, a chance to tally up some easy pages.) It’s called “Camp Fat,” and it’s about a little girl named Clara who befriends a weight-loss camp counselor who curiously only shows up at night. It’s a wonderfully weird story, one that fools the reader (and Clara) into thinking it’s headed in a very predictable direction, then takes a number of sharp left turns. “Not really,” I say happily. That night, with great ceremony, I pull out a marker and finalize the contest tally. She beat me by 910 pages. The loser, we’ve said, has to write a story for the winner to read. I lost, and now I’ve written the story. I hope someday she reads it.